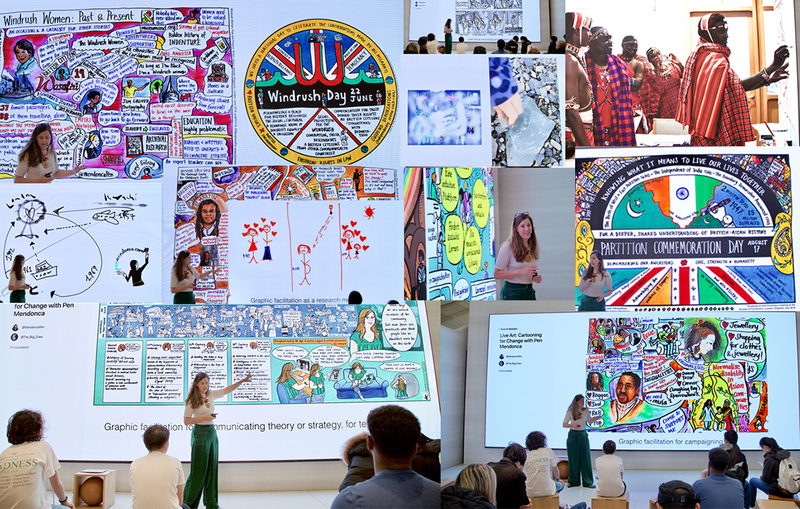 Dr Penelope Mendonça is a pioneering graphic facilitator and cartoonist with more than twenty years experience of engagement and development work within the public and voluntary sectors. Using process design, meeting facilitation techniques, graphic recording and illustration, Pen supports a diverse range of organisations, communities, adults and children to listen, reflect, find creative solutions and agree a vision or plan. She is a skilled facilitator, experienced in work with senior managers and policy makers as well as front line staff, campaigning groups and those whose voices are rarely heard. As part of her approach Pen visually captures key issues on large wall charts in real time for meetings and conferences. Pen is known for her ability to work across communities and sectors, representing diversity, intersectionality and inequality, including issues that may be considered particularly sensitive or controversial. She also creates templates and strategy maps for organisations seeking to research or communicate a complex idea, structure, pathway or narrative with a wider audience. Pen trained in graphic facilitation techniques with Grove Consultants International in 2000. Since then she has developed a significant body of highly original work tailoring her practice to meet the needs of each unique project. Her artwork, writing, storytelling and animation have been widely published and translated in to numerous languages. She has a particular interest in work on gender, race and ethnicity, disability and mental health, family and age. Prior to setting up her own business Pen worked as a National Officer for a large disability charity. She has a background in social care (mental health, learning disability and older people’s services), she has provided direct support to people as well as managed care services, and even cleaned some of them. Pen is committed to human rights, co-production, person-centred approaches and social inclusion. Her work was recently commended by the National Co-ordinating Centre for Public Engagement. Pen completed her PhD in 2019 (Central Saint Martins, University of the Arts, London) developing and critically examining her method: Values-Based Cartooning, and applying it to a study of single motherhood. She has an MSc in Citizenship Studies (Birkbeck, University of London), a BA (Hons) Fine Art (Chelsea, University of the Arts London) and a Diploma in Parks and Recreation Management (Lincoln University, NZ). Pen grew up in Christchurch, New Zealand. She has a mixed heritage and has worked across communities in India, the Middle East and the UK.